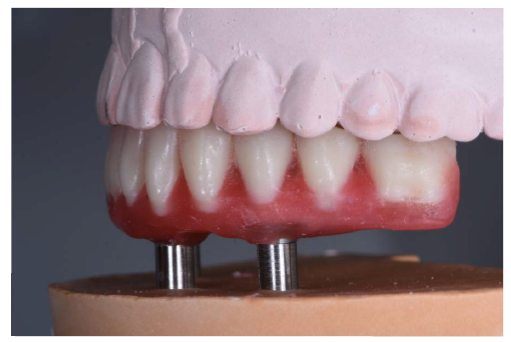 Discover a clinical case showing the possibilities offered by the Trefoil system to clinicians wanting to treat patients with an immediate loading protocol. Time is a precious resource. Many patients, remembering their past experiences of pain and discomfort in the dental chair, do not accept comprehensive dental treatments as they are not prepared to sacrifice prolonged periods of time and social activities to multiple, potentially prolonged surgeries. 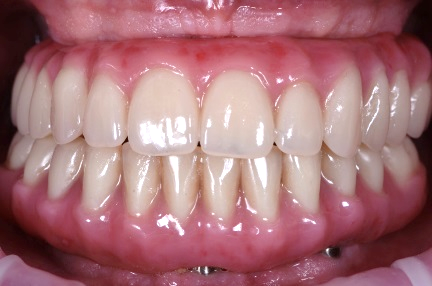 This clinical case demonstrates the possibilities that the Trefoil system offers to clinicians wanting to treat edentulous patients with an immediate loading protocol. 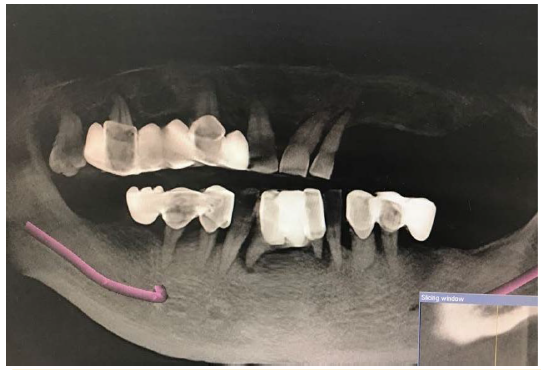 The patient presented with an edentulous maxilla (Fig.1) which had previously been restored with a full laminar denture (Fig.2), and a partially edentulous mandible with a failing prosthesis and Class III mobility of the residual dentition. Because the patient did not live in the same city as the practice, it was important to consider (and reduce when possible) treatment time and number of appointments. After removing all mandibular teeth, we proceeded to elevate a full-thickness mucoperiosteal flap. It was critical at this stage to have direct visual control of the mental foramen. 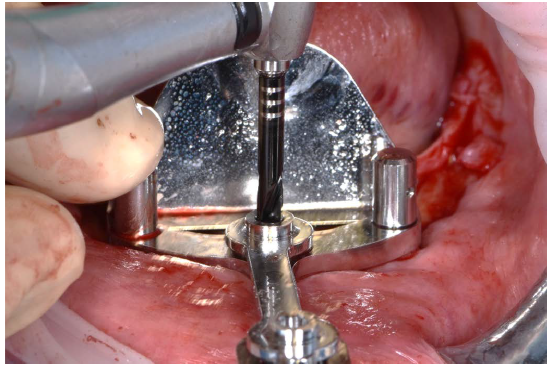 A round bur mounted in a straight handpiece was used to adjust the alveolar crest and to prepare a flat bony bed for implant insertion (Fig.5). 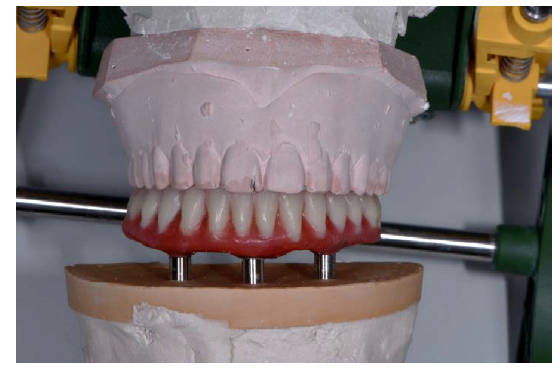 Parallelism of the occlusal plane was controlled using a maxillary denture. When the alveolar crest adjustment was completed, the first surgical template (a Guide Template) was used (Fig.6). 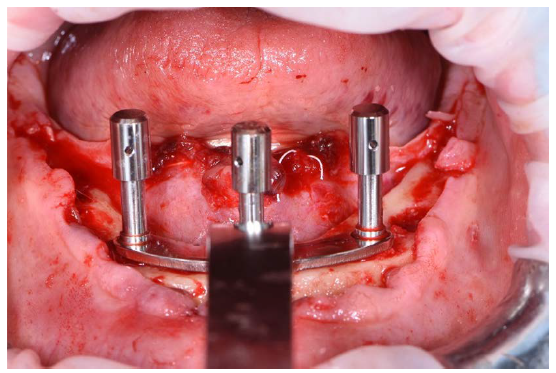 This allowed us to evaluate future implant positions relative to the alveolar width and mandibular mental foramen. A round bur was used to mark the implant’s position. Next, an Evaluation Template was used to drill the central implant position to the appropriate depth using a Twist Drill. 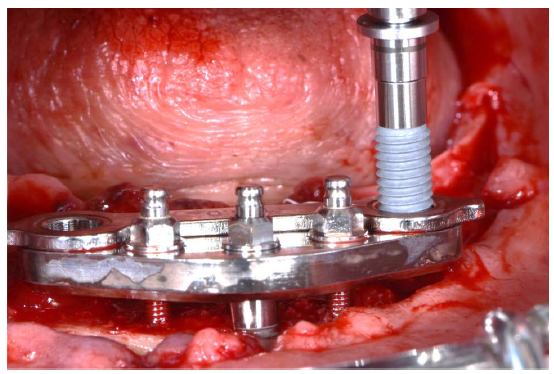 The template was then stabilized in the central implant position using a Guide Pin (Fig. 7), after which the two posterior implant positions were prepared using a Twist Drill (Fig.8). The template was removed after verifying that the final three Guide Pins fit (Fig.9). 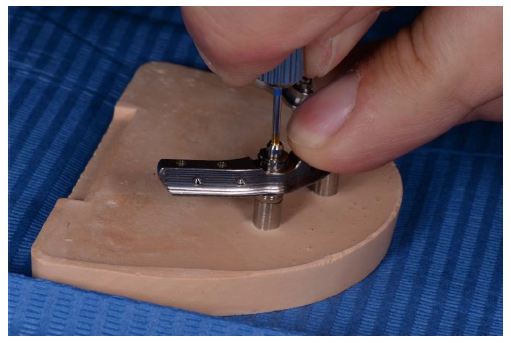 A Positioning Template was then fixed with two Guide Pins in the posterior osteotomies, and drilling templates were used to prepare the central implant site (Fig.10). The drilling protocol varies depending on the bone density. 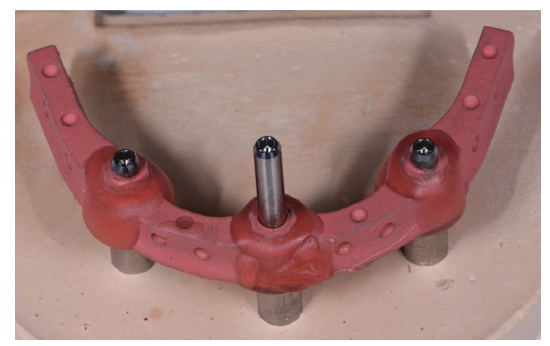 After inserting the central implant (Fig.11), the Positioning Template was removed in order to assess the position of the implant and to check for primary stability using a manual torque wrench. 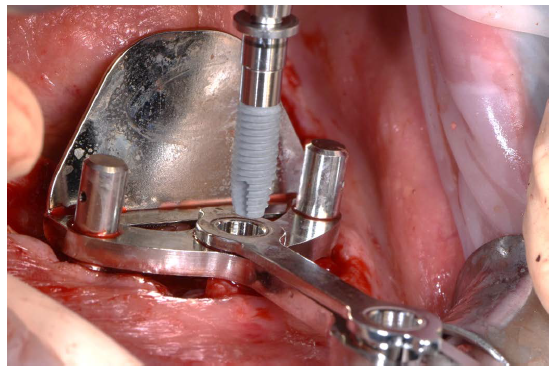 If necessary, this also provides an opportunity to adjust the implant’s vertical position. 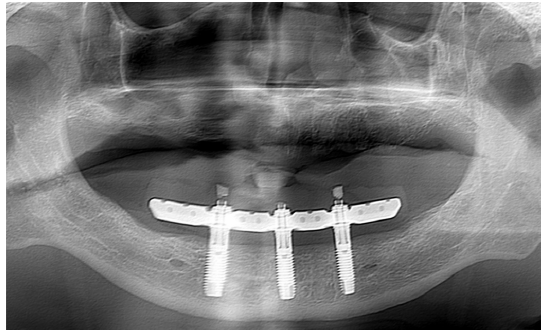 The V-Template was fixed with the support of two Guide Pins, a Temporary Implant Screw and two Stabilizing Screws (Fig.12). Drilling templates were used to prepare two posterior osteotomies, similar to the central implant. 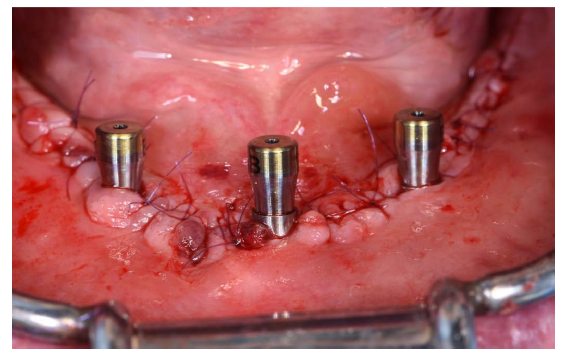 After the two posterior implants were inserted (Fig.13) and all the Stabilizing Screws and the V-Template were removed, we could assess the final position of the inserted implants. 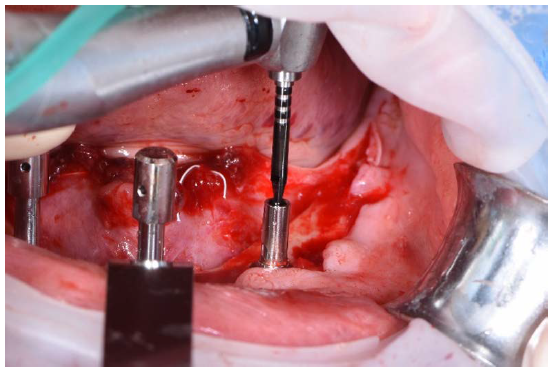 The next step was the verification of the implant position and the evaluation of the distance between the bar and the alveolar crest before continuing with the verification index. 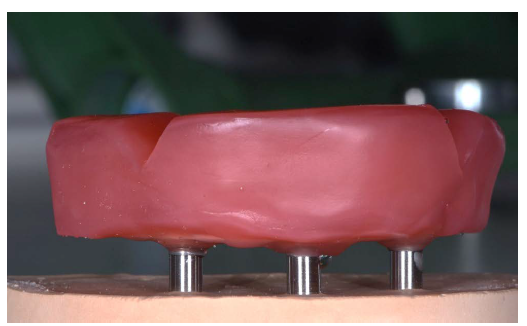 A Try-in Bar can be screwed to the implant to verify if the implants are placed inside the fixation mechanism and if the available space for the acrylic gum on the bar is sufficient. 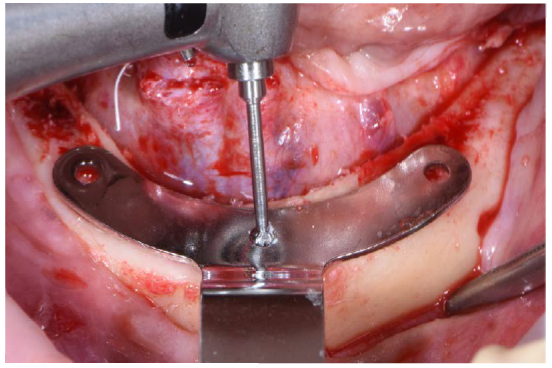 If the space is insufficient further alveolar crest adjustment is needed. 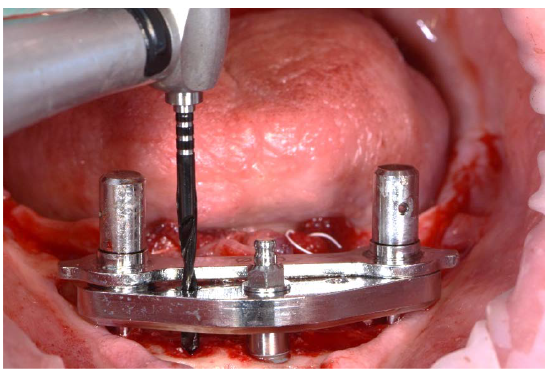 Next the final implant positions were registered with the aid of a verification index (Fig.14). 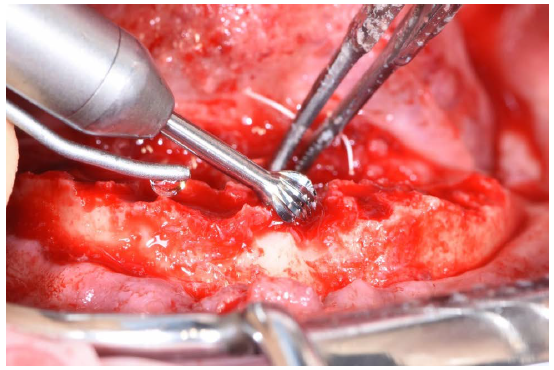 Then the healing abutments were attached and the wound sutured (Fig.15). 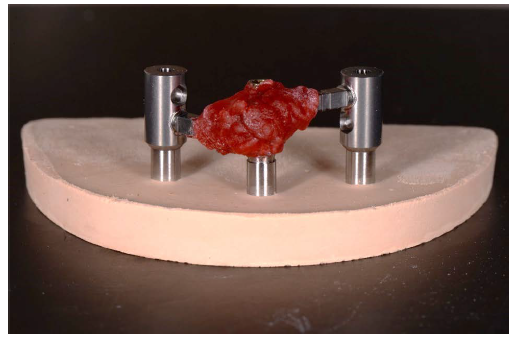 A master model was cast after implant replicas were connected to the verification index (Fig.16). After removing the verification index the bar was screwed in and the compensation mechanism locked with Try-in Screws, and the passive fit of the bar on the model was checked (Fig.17). The bar was then sand blasted and opaqued, and the compensation mechanisms blocked with acrylic resin (Fig.18). 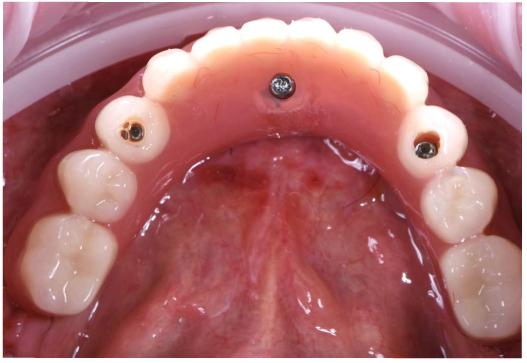 The central Try-in Screw was replaced by a Lab Screw and a wax rim was added to the Trefoil Bar to register the inter-maxillary relationship. 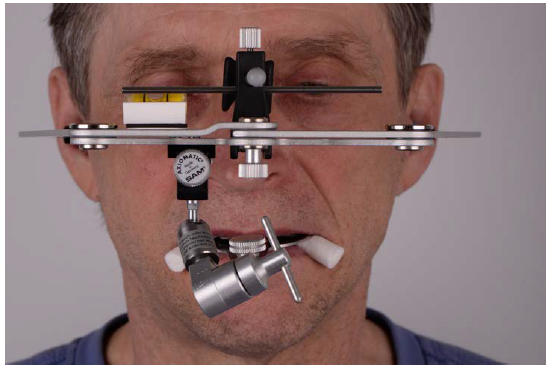 The master model with the Trefoil Bar and the wax rim was then mounted in the articulator (Fig.19). A tooth set-up was prepared by the dental technician and an intra-oral wax-try-in performed to verify occlusal function and esthetics (Figs.20,21). After the design was verified, the dental technician completed the acrylic work and polished the prosthesis. 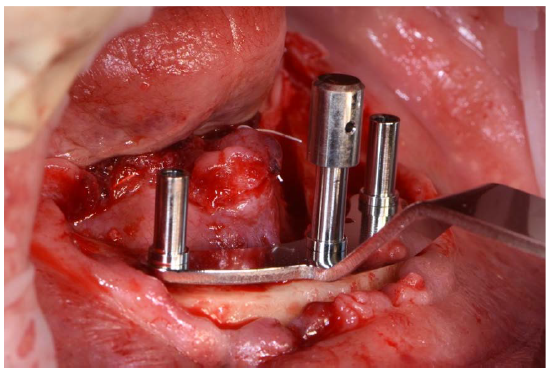 The final prosthesis was fixed with a clinical screw torqued to 35Ncm (Fig.22). The screw access holes were blocked with Teflon tape and composite, and a minimal occlusal correction was performed (Fig.23). A post-operative X-ray was made immediately after surgery (Fig.24). 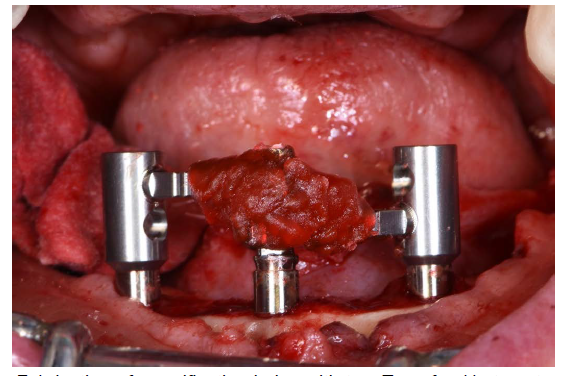 Three months later, maxillary rehabilitation was performed using the All-on-4® treatment concept and a provisional prosthesis was manufactured (Fig.25). 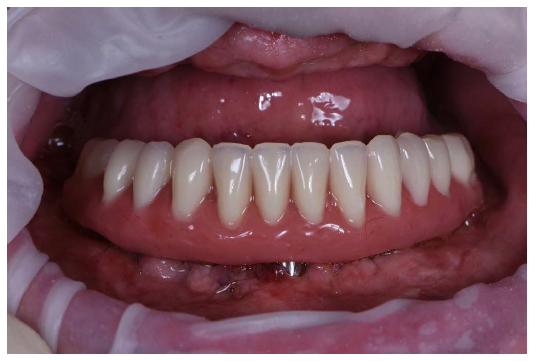 Six months after surgery, the final acrylic prosthesis on a NobelProcera titanium framework was fixed (Fig.26), and the lower Trefoil-based prosthesis was realigned to customize the gingival side. 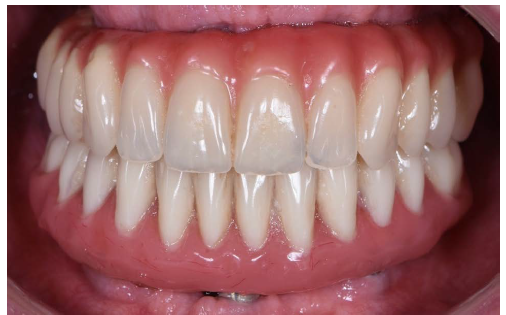 “Life with dentures was burdened with restrictions and limitations that often made me want to simply throw them away. It was nearly impossible to imagine that fixed teeth can be returned this quickly and that the new teeth felt like my own so soon. 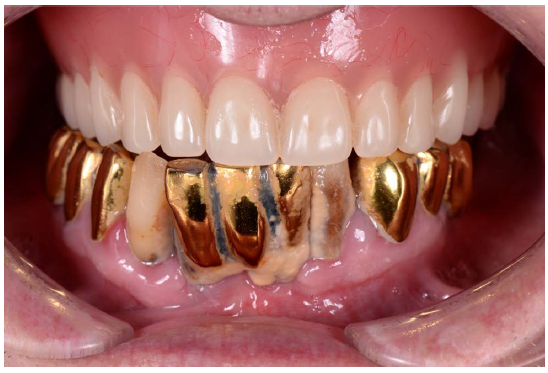 We see a great potential in the Trefoil system to rehabilitate the edentulous mandible, with the surgical and prosthetic protocols being clearly outlined. Following a learning curve and gaining more experience, the treatment takes progressively less chair time, shortening the rehabilitation period. The use of standard components makes it possible to decrease clinical costs, which ultimately makes this type of treatment more affordable for the patient. The Trefoil system expands medical capabilities for the rehabilitation of patients with an edentulous lower jaw and offers a faster and more affordable fixed treatment solution in comparison to conventional treatment methods. Now we are able to offer a high-quality implant-supported fixed bridge in one day to more patients1. I believe this system will allow us to treat more patients and significantly improve their quality of life. 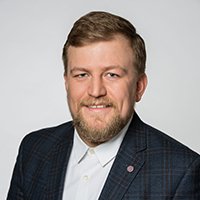 Maxim Kopylov, DDS Oral Surgeon, Prosthodontist, specializes in complex bone regeneration surgery and soft-tissue management, and has extensive experience with immediate loading and zygomatic implants. 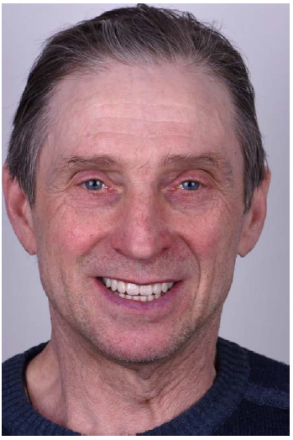 He has led numerous oral surgery courses, is an active member and lecturer at several Russian and international industry events, and is an affiliate of the European Academy of Esthetic Dentistry. 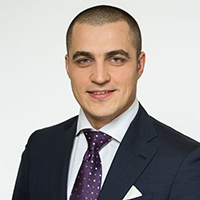 Rafael Paremuzyan, DDS, Prosthodontist, practices in several dental clinics in Moscow on restorative dentistry, and specializes in functional and esthetic restorative rehabilitation. Images and case courtesy of Dr. Kopylov and Dr. Paremuzyan. Treatment with dental implants is a surgical procedure and requires prior evaluation by your dentist to make sure your dental and general health permits dental implant treatment. Placement of dental implants is done during a surgical procedure, which has associated general risk, including infection, possible damage to nerve tissue, and excessive bleeding during or after the surgery. Consult your clinician to find out if dental implants are the right option for you.